Fruit grown in tropical regions, that is high in potassium. Green when young and yellow when ripe. Bananas can be used when ripe and unripe. Green bananas make tasty savoury dishes, while ripe bananas are sweet to taste and are usually used to make drinks and desserts. Bananas are elliptically shaped fruits that have a firm, creamy flesh wrapped inside a thick inedible peel. 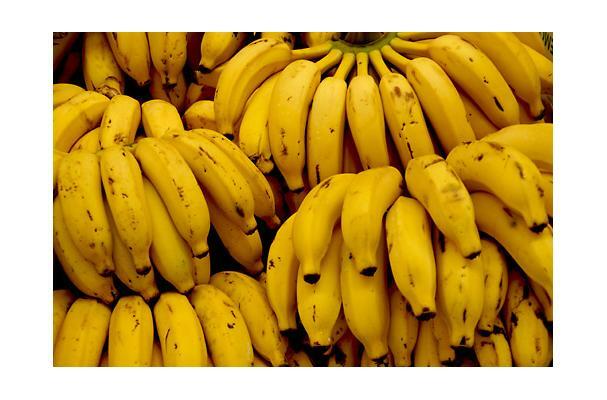 Choosing: Look for firm, bright yellow bananas that don't have black spots or blemishes. You should be able to detect a light fragrance through the skin. Buying: Bananas are widely available at all grocers. Procuring: Bananas are a tropical fruit, principally grown in parts of southern Asia, Latin America and South America. Peel and eat. Overripe bananas (after the peel has browned considerably) may be frozen and used in breads and other baked goods. Cleaning: Rinse the exterior if you feel it is necessary, but the peel keeps the bananas safe and clean so it isn't necessary. Do not store them inside a refrigerator. Do not place them inside a warm room near the stove.